Straw bale construction is a building method using bales of straw as structural elements, building insulation or both. Straw is an agricultural by-product—the dry stalk of a grain plant left over after the grain is harvested. Straw bales, not to be confused with hay bales which are cut and dried grass or legumes, are made from a variety of grain plants: wheat, rye, rice, barley, and oats. The project started as an idea of two University of Idaho Environmental Science students, Maia Hawkes and Amber Rand, for their Independent Study Course. Soon after, then UI instructor Kurt Rathman and his senior Architecture Design students jumped on board, and the idea began to soar. Collaborating with PCEI staff on the design, each student played a role in both the design and construction process. Materials were ordered and site excavation went underway on April 11, 2005, with PCEI Head Contractor Steve Streets and his Kubota tractor. Concrete was poured, framing constructed, bales hauled and stacked, bales strengthened with wire and metal lath, the first coat of stucco applied and the green roof planted. Bike racks located inside the pavilion were created by Moscow’s Bicycle Brothers, Isaak Julye and Emmett Breedlovestrout. These fun and festive racks — resembling butterflies, cattails and garden tools — provide special places to lock your bike and will leave you with a smile! This exciting project is all about connecting people, place and community. 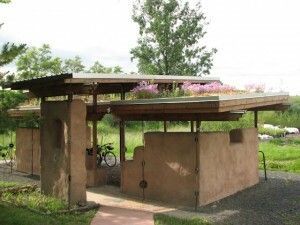 With a whirlwind of activity and over 800 hours of volunteer help, the new bicycle parking pavilion incorporates PCEI’s goals by encouraging eco-friendly transportation and by serving as an environmental education tool to inspire alternative and sustainable building practices for years to come. Why Build with Straw Bale? straw bale construction allows for architectural flexibility, such as smoothed corners and rounded edges around doors and windows. Straw bales can both take the place of a traditional wood frame and be used as insulation. It is important that bales are raised off the ground on a foundation so they do not soak up moisture. After the bales are stacked in place, plastering can begin. Typically stucco cement, gypsum plasters, earthen plasters and lime are used to enclose the bales. The plaster protects the bales from moisture and seals the walls, reducing fire hazards. Little experience is needed to construct a straw bale home, but it is good to have a professional’s help when you take on your first project. Some great resources for straw bale are located in the Spokane area (see Further Resources below). Check out this video and article highlighting the building process of two community members’ straw bale house.